For Dr. Danny Domingue, his toughest cases as a dentist are actually the cases he hasn’t tackled. It makes sense that it’s hard for Domingue to see patients go untreated, because he gets a tremendous amount of satisfaction in helping others. A Lafayette native, Domingue says the men in his family influenced his decisions and pushed him to work hard. While a student at St. Thomas More Catholic High School, Domingue’s grandfather, Dr. W.I. Smith, a “larger-than-life” influence on Domingue, pushed him to consider dentistry instead of medicine. His father, Raymond, instilled in the young Domingue a strong work ethic. His uncle, Dr. J. Jerome Smith, whom he would eventually work for, provided the guidance he needed to get into dental school. Domingue graduated from LSU, where he earned a bachelors of science, in 2003, and then completed dental school at LSU School of Dentistry in New Orleans in 2007. 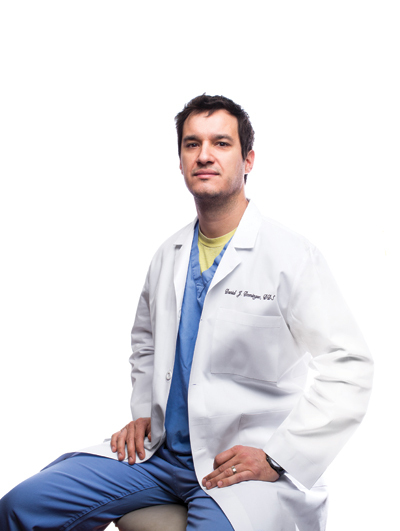 After dental school, he moved to New York for three years to pursue a residency and fellowship. At Brookdale University Hospital and Medical Center in New York City he served as Chief Resident of the Dental and Oral Surgery Department and trained in Advanced General Dentistry and in Dental Implantology. During this time he was awarded the Certificate of Achievement from the American Academy of Implant Dentistry for outstanding leadership in Implant Dentistry, a fellowship from the International Congress of Oral Implantologists, and an associate fellowship of the American Academy of Implant Dentistry. Domingue was also awarded “diplomate” from the American Board of Oral Implantology, the highest award possible for a general dentist practicing implantology. At the time he was recognized as the youngest recipient of this award in the world. After completing his residency, he married his wife, Megan, in Denver, Colorado. They moved back to Lafayette to start a family and practice dentistry, and soon they had their daughter, Danielle. After practicing for three years in Lake Charles, Domingue accepted his uncle’s offer to become a partner in his practice in Lafayette. Domingue cites many things he enjoys in his work, especially the familial nature of it. He also enjoys the immense rewards that come with treating patients. “I enjoy giving people the smile they’ve always wanted, and especially helping those who have been living with pain or missing teeth to give them their old smile back,” he says. Outside of work, Domingue enjoys spending time with his daughter and wife. He is also involved in the anti-abortion movement in Lafayette: recently he started a Right to Life Education Endowment Fund in honor of his grandfather and Dr. Zerbon Bienvenue, who Domingue says are considered to be the gradfathers of the pro-life movement in the Acadiana Parish area.